The FortiSwitch-80-POE provides full 15.4 Watts/port of Power over Ethernet (POE) in a cost-effective form factor for the distributed enterprise or small office. This eight-port GbE switch provides 62 Watts of POE power to four devices, the highest in the industry. 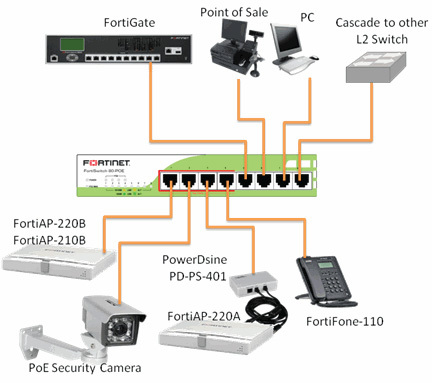 You can connect wireless access points (such as the FortiAP product family), IP phones (such as the FortiFone product family), and IP cameras to the POE ports. The FortiSwitch-80-POE eliminates the need for additional POE injectors, simplifying your small office network while improving performance. The remaining four GbE ports can accommodate uplink ports as well as additional devices such as printers, and back office equipment. Delivers convenience and flexibility for smaller networks. Powers any device accepting PoE while reducing deployment costs and supporting uplink connections.